Blue-gray gnatcatcher, photographed at Green Cay Nature Center, Boynton Beach, Palm Beach County, in February 2016. 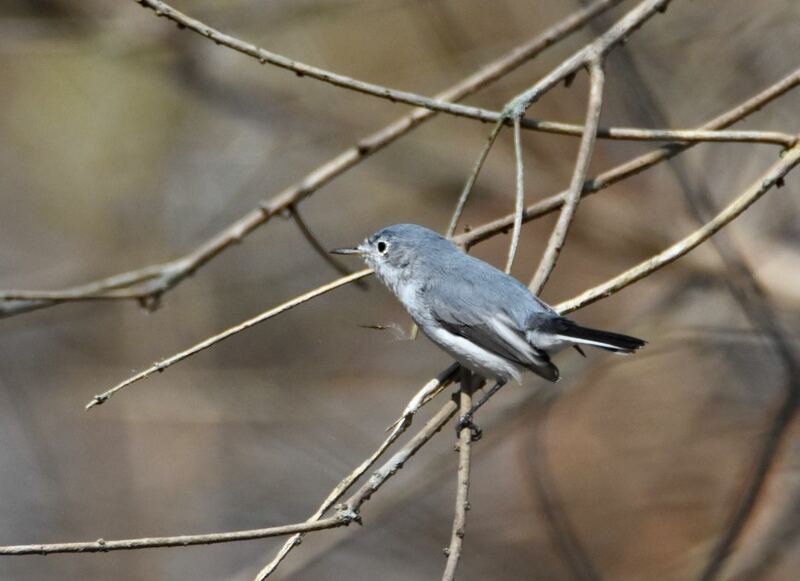 Contrary to the name, the blue-gray gnatcatcher, Polioptia caerucea, isn't all that fond of gnats. It's more likely to down any variety of moths, hoppers and spiders, before going to town on a bunch of the tiny bugs. It is, however, unequivocally various shades of blue and gray (with some blacks and whites thrown in for good measure). This tiny gnatcatcher — there are 20 species of gnatcatchers worldwide — is a denizen of open woods. They make no secret of their presence through song and by incessantly hopping and flying limb to limb, tree to tree, in search of a good meal. Getting one to sit still long enough to get a clean look at him, that's more than a little difficult. The blue-gray gnatcatcher is a migrating bird. Here in South Florida, they're a common winter visitor. Most distribution maps show a year-round population in Florida roughly north of Lake Okeechobee and a winter only population south. But according to a Florida Fish and Wildlife Conservation Commission report done in the early 2000s, those maps don't tell the full story. 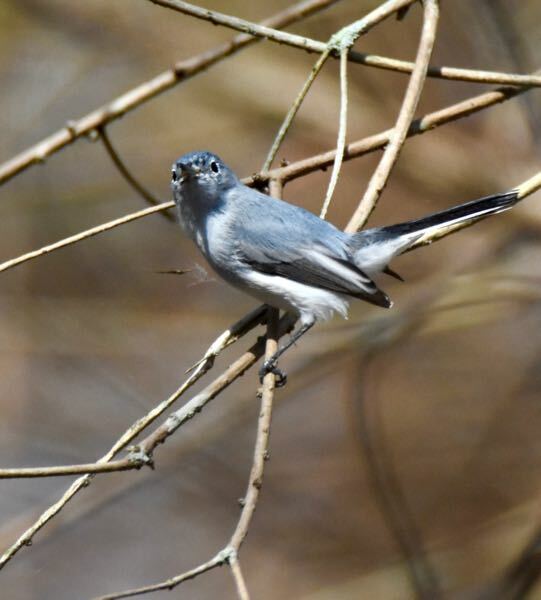 Blue-gray gnatcatcher can be found anywhere in the state any time of the year. However, they're more likely to be seen farther north during summer and farther south during the winter. But they have been found nesting in all of Florida's 67 counties. They spend the summer in most of the United States, New England to the Great Plains, and the central and southern Rockies to California, retreating to parts of Mexico, Florida and the Caribbean in winter. They're year-round residents along the Gulf and southeastern Atantic coasts, into Mexico and Central America. Blue-gray gnatcatchers are exceptionally small, with a body length of four inches, more or less, and a wingspan of about six inches. They have white rings around their eyes and a dark "brow" over them that gives them an "Angry Birds" look. They have a long, dark tail, some barring on the wings and a thin bill. Petersen's Guide says the shape of the bird suggests a mockingbird in miniature. It even has some of the mockingbird's vocal abilities, in that it can mimic bits of other songbirds' routines. These birds inhabitat hardwood swamps, pinelands, sandhills, even the 'burbs. 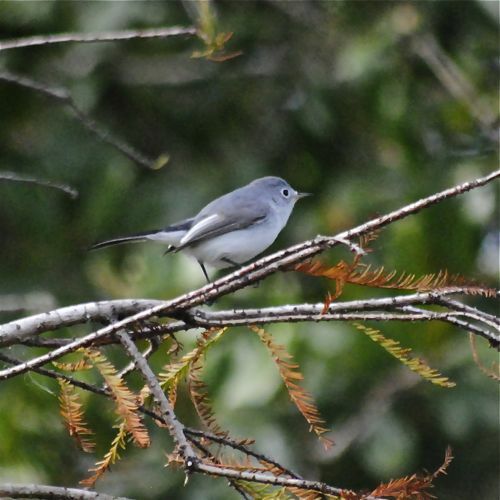 Basically anywhere there is sufficent open woods you'll find the blue-gray gnatcatcher. In Florida, March to July is generally their breeding season. Both males and females take part in nest construction, a small cup made of grass, leaves, spider silk and lichens. Females lay clutches of four eggs, typically, which take about 13 days to hatch. The young will require 10 to 12 days of care before they're ready to fledge. Both parents feed the young, providing them with the same diet they eat but with a slight twist. Younger hatchlings get smaller bugs; as they grow they get bigger bugs. Most females will do a single brood per season, but some in Florida will attempt a second. Blue-gray gnatcatchers are members of Polioptilidae, the gnatcatcher family. By the way, there are four species of gnatcatchers in North America, but the blue-gray is the only one that truly migrates.